First Options Trading Review – Scam Warning!! Note: At the time of posting this review, the domain FirstOptionsTrading.com was down. If anyone is aware of a different domain these scammers are using, please let us know by commenting below. Rather sinister and deterring reports are coming to light about First Options, a premium Bitcoin investment management service. Operated from FirstOptionsTrading.com, First Options reflects a rather inconspicuous and vague site design. Functioning as a Bitcoin seeding service, First Options Trading allows traders to invest their bitcoins to have the liquidated value of deposited Bitcoin be invested among stocks, options, currencies and commodities. Throughout this factual review, we will discuss why you should approach this investment opportunity with caution and avoid this service by any means necessary. What Is First Options Trading? According to the site, First Options Trading is a diversified Bitcoin investment fund management company. Allegedly headquartered out of the United States, the mission statement found on their Info page claims that they strive to provide premium-level investment solutions to clients all around the world. These solutions take place through a process known as Bitcoin seeding. Bitcoin seeding is where external investors fulfill the deposit requests required by the site where those funds are liquidated then invested by “professional” traders on their site. These traders take your liquidated bitcoins, then invest them through online businesses, options, currencies, commodities along with stocks. These accrued profits are then pooled together and diversified among each individual external investor where compound interest is allegedly added to the profits accumulated. According to the site, the physical office address for First Options Trading can be visited at 1050 17th St NW #800, Washington, DC 20006, USA. How does First Options Trading service work? According to the site, the minimum invest quantity of Bitcoin value must equate to a value of at least $1,000. After you fulfill your initial deposit, there is a 90 day lock-in period where you cannot withdraw any of your funds. Your deposited bitcoins are then pooled together with other investors who have made deposits. First Options Trading will then invest on your behalf. This entire process is called Bitcoin seeding and your profit potential is based upon a percentage of how much you initially invested. Now, it is evident that First Options Trading would prefer you to invest as many bitcoins possible due to their questionable business model. Claiming that investors will receive a larger percentage of the accrued profits is a shady marketing tactic, especially when we aren’t provided with any information pertaining to how the funds are managed, whether they invest with regulated firms or haven’t been shown proof of any executed withdrawals. Nevertheless, we feel obliged to warn potential investors that First Options Trading isn’t as authentic of a service as it appears to be. A couple of nasty reports have been found on the internet and one in particular really stands out which can be found at ripoffreport.com. Another ideal you should bear in mind would be that since Bitcoin is a decentralized currency, that once you execute a Bitcoin transfer, it is irreversible, just something to remember when dealing with unproven and questionable Bitcoin related investments. Does the website promise unrealistic returns? On the general information page, there is zero information on what you can expect to earn through your Bitcoin investment. However, if you visited the Diamond Trading page you will be confronted with some rather questionable return promises that certainly fit that profile. Claiming that if you invest 2 BTC, you will generate a profit 10 BTC with a 14 day period is down-right outrageous. It doesn’t stop there though, if for some reason you were foolish enough to deposit 5 bitcoins with this service, you will then allegedly earn 25 BTC within that same period. Is there information regarding the owners of the site? No information relevant to the owners or company behind this site are presented to us. This is typically a sign that we are dealing with an anonymous service that should not be trusted. Most of the legitimate launches you will come across in the cryptocurrency niche are quite open about their identity which is because they have nothing to hide, unlike First Options Trading. A domain search will reveal that firstoptionstrading.com was created on March 23rd, 2016. Furthermore, the creators or company behind this site employed a privacy blocker so finding identifying information regarding the owners of this site cannot be achieved through ordinary measures. Are there any shady characteristics exhibited on the site? The creators behind this website did a great job of making this site look authentic and genuine. However, shortcuts were taken which is where we were able to discover some misleading characteristics in regards to the testimonial section. 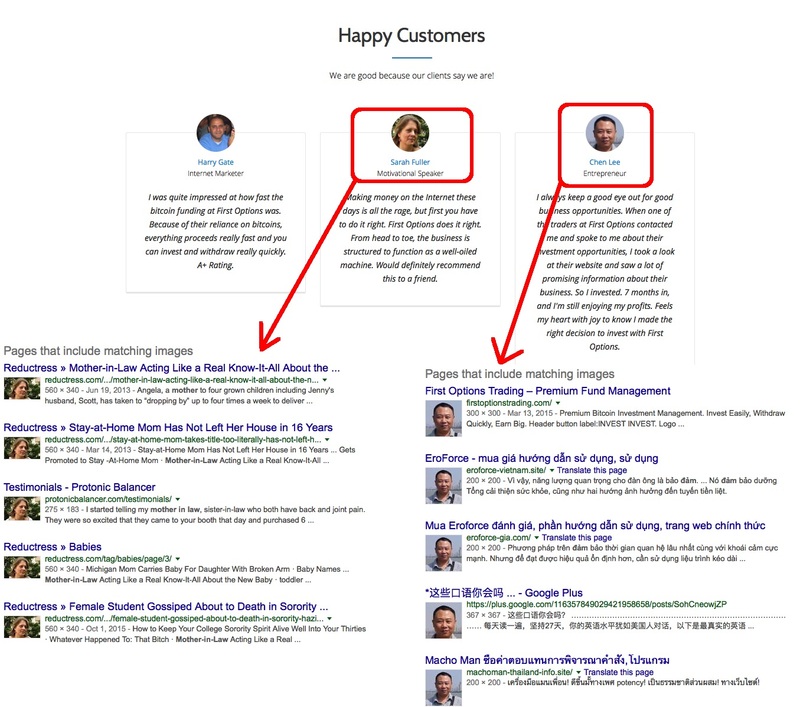 Take for example “Sarah Fuller” and “Chen Lee” who have claimed to have generated profits and would definitely recommend the service to other friends. As you can see below both of these “happy customers” are nothing more than stock photos taken somewhere online. Does the site have a physical address? If you scroll all the way down the home page of firstoptionstrading.com, you will notice that they provide some identifying features. The email address listed is [email protected], while their telephone number provided is +1 202 464 2507. In addition, their disclosed location as mentioned above is 1050 17th St NW #800, Washington, DC 20006, USA. 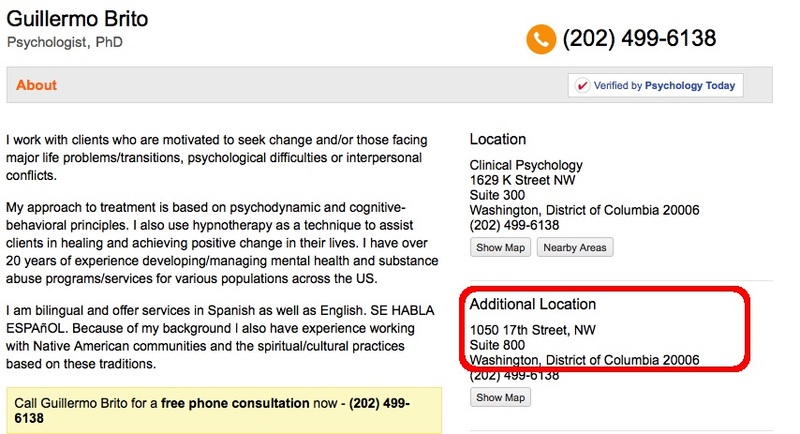 What we found interesting though would be how that address, when searched, actually comes up to be the location of Guillermo Brito, a clinical psychologist. So not only have we been provided with phony testimonials but we are also being lied too about the physical location of this company. This is a tell-tale sign we are dealing with a fraudulent and untrustworthy investment service. How popular is the site? Fortunately, FirstOptionsTrading.com is not a very popular site. During the time of writing this review, the site possess a global rank of 5,263,034, according to SimilarWeb.com. The only site currently linking to the First Options Site would be ripoffreport.com, where if you clicked on the link above you could have seen the user report filed against Tom White, an alleged fund manager at First Options Trading. Implementing deceptive testimonials and incorrect identifying features is a clear sign that First Options Trading is not a trustworthy Bitcoin investment. First Options Trading is nothing more than an anonymous scam launch, created by scumbags who prey upon the inexperienced Bitcoin investor demographic. Don’t fall for the misleading and seemingly legitimate Bitcoin investment scam, we assure you nothing but frustration and loss of your precious bitcoins will occur! To date it appears this site has stolen 5.402 BTC. Don’t become a statistic and avoid this site! Verdict: First Options Trading is a SCAM! Have you been scammed by First Options Trading? Share your experience and feedback by leaving a comment below! Yes I am being in spammed and harrassed all days in my messenger by this person pushing me to talk to his referrals for references so i can made deposit with them. The person in question claim to be the owner: Anderson peterson on fb whose Nickname responds to @auwal.saminu.779. When do you research his profile he doesn’t provide too much information about him and his nickname sounds like Arabic or someone from India so this is clearly someone using a beat being service to cover up the real IP address. When asked to talk about with some investors he passed me to someone named “James Collier Frederick” again with nothing of info in his profile,and probably is himself impersonating somebody else with stolen pics. Be VERY cautious about him and block him. He is in infiltrate in all bitcoin and nadex binary fabebook groups.